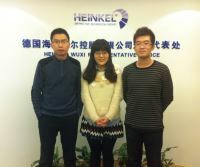 HEINKEL DRYING AND SEPARATION GROUP increases commitment in Asia and establishes a new office near Shanghai. As Wuxi city is an expanding city HEINKEL group chose with it the ideal location for establishing a representative agency in China. For the group which operates worldwide local presence now takes top priority also in China. Customers benefit from professional support for operating their process equipment and systems for solid/liquid separation. “Our experts for sales and after sales support customers during the process of choosing and testing, commissioning and also operating”, says Thomas G. Kleiner, managing director of HEINKEL. HEINKEL group is now able to do local business also and set all the conditions for its increasing commitment in China with experienced staff in modern office premises.